Represents an individual participant in the Interaction. A lifeline represents an individual participant in the Interaction. While Parts and StructuralFeatures may have multiplicity greater than 1, Lifelines represent only one interacting entity. 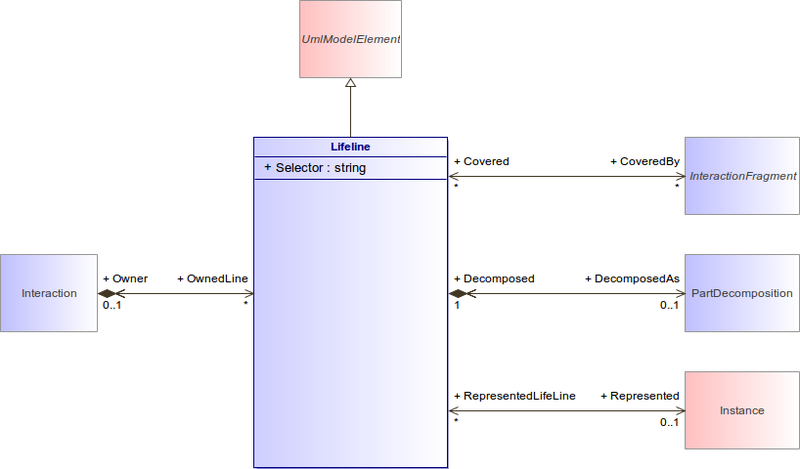 If the referenced Instance is multivalued (i.e, has a multiplicity > 1), then the Lifeline may have an expression (the "selector") that specifies which particular part is represented by this Lifeline. If the selector is omitted, this means that an arbitrary representative of the multivalued ConnectableElement is chosen. If the referenced ConnectableElement is multivalued, then this specifies the specific individual part within that set. References the Interaction that represents the decomposition. References the Instance the Lifeline represents. Document automatically generated by Modelio Document Publisher.